The Lincoln Memorial along with all other National Parks and Monuments are closed. 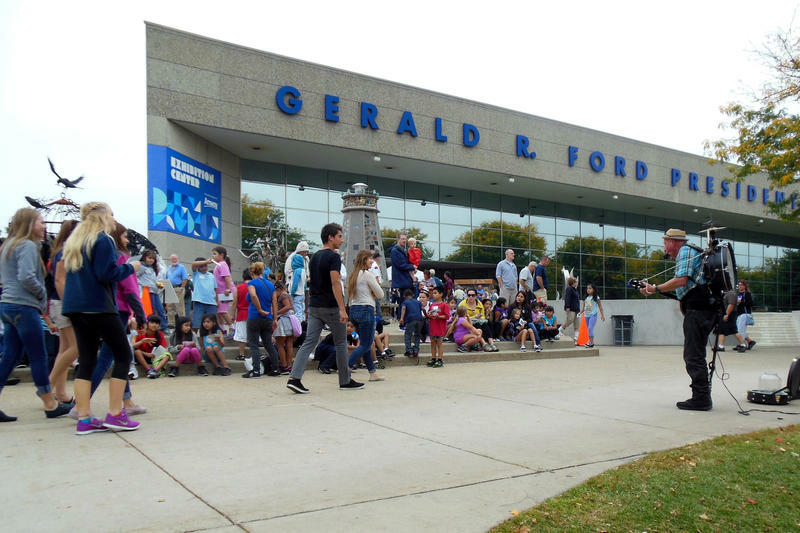 The Gerald R. Ford Presidential Museum in Grand Rapids was closed as part of the federal shutdown. 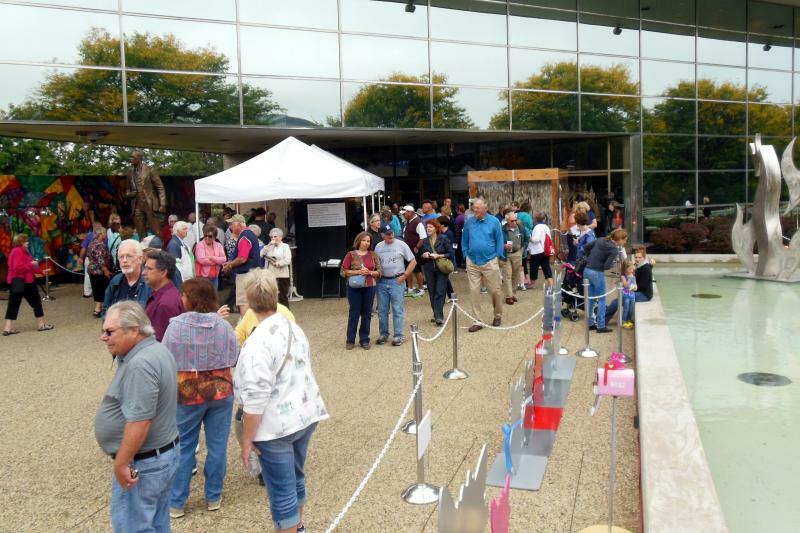 ArtPrize visitors peer inside the museum that's closed because of the federal shutdown Tuesday. 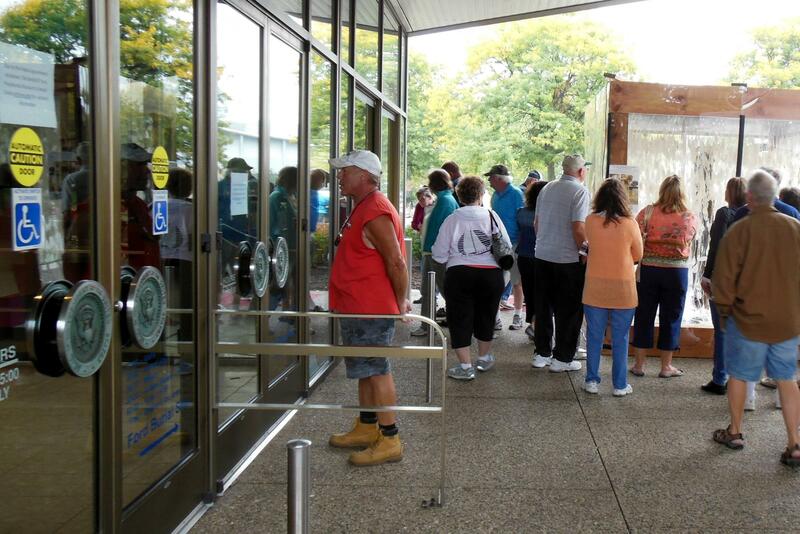 Thousands of tourists swarm the grounds near the Ford Museum Tuesday in Grand Rapids. ArtPrize exhibits that were located inside of the Ford Museum were moved outdoors. The shutdown of the federal government is here. Now what? We'll keep tabs on the people, programs, and places being affected by the shutdown on this post. Drop us a note below if you're affected by the shutdown or if you know of a program that we haven't mentioned. If you've sat this story out, and need some "Shutdown 101," the Washington Post's WonkBlog has "Absolutely everything you need to know about how the government shutdown will work." That should about cover it. The shutdown shakes things out into two silos. Officially, the Washington Post reports that they don't use that language anymore because feelings can get hurt (who wants to be "non-essential"), but the intent remains. Basically, "non-essential" stuff will close down first. "Essential" services will continue, but will be squeezed the longer a shutdown continues. Active duty military personnel will be unaffected as special legislation was passed to keep them in service and paid. A protracted government shutdown could begin to affect these services as many workers could be working without pay. Funding for the USDA's "Special Supplmental Nutrition Program for Women, Infants, and Children" is unclear at this time. The federal government has a list of what government services will be affected during the shutdown. Wednesday, October 2, 2:00 p.m. Here are a few more areas impacted by the shutdown. Paychecks have stopped for 4,200 civilian employees at the U.S. Army Tank-Automotive Command in Warren, and 650 workers at the Selfridge Air National Guard base have in Harrison Township, according to the Macomb Daily News. And staff has been furloughed at the Combat Readiness Training Center in Alpena. Tuesday, October 1, 5:30 p.m.
Michigan Gov. Rick Snyder urged politicians in Washington to "stop the gridlock." If the federal government is shut down for just a day or two, the effects on Michigan's residents will be minimal. A longer-term shutdown, though, could have consequences. Right now, our budget office is monitoring the situation to determine the impact that the shutdown will have on various federal programs in our state. 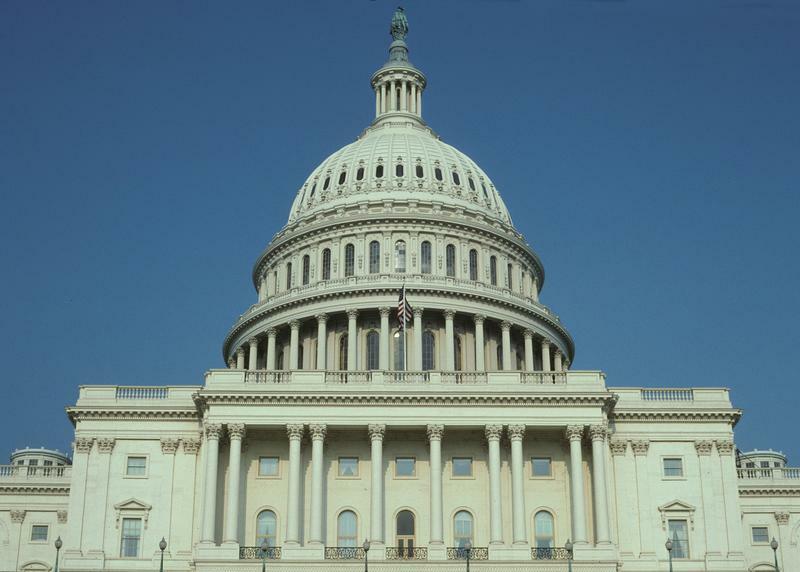 State workers whose salaries are paid for using federal funds are being affected by the government shutdown. The state is sending furlough notices to unions representing tens of thousands of state workers as a precaution in case there is an extended shutdown of the federal government. The state gets more than 40% of its budget, or just over $20 billion, from the federal government. The Associated Press reports that Michigan will lose $18 million each day of the shutdown. Michigan budget director John Nixon says he worries about welfare and food assistance programs because spending on them normally is protected in a shutdown, but the programs weren't reauthorized. The 1.6 million Michigan residents on food stamps will be OK in October because their debit cards have already been loaded. Tuesday, October 1, 9:15 a.m.
Michigan will feel the effects of the federal government shutdown. Some will feel the pinch sooner than others. 41% of Michigan’s state budget comes from the federal government. A shutdown doesn’t mean all that money will stop flowing immediately, but it will slow. Several food and other assistance programs for the poor will be affected sooner than most. 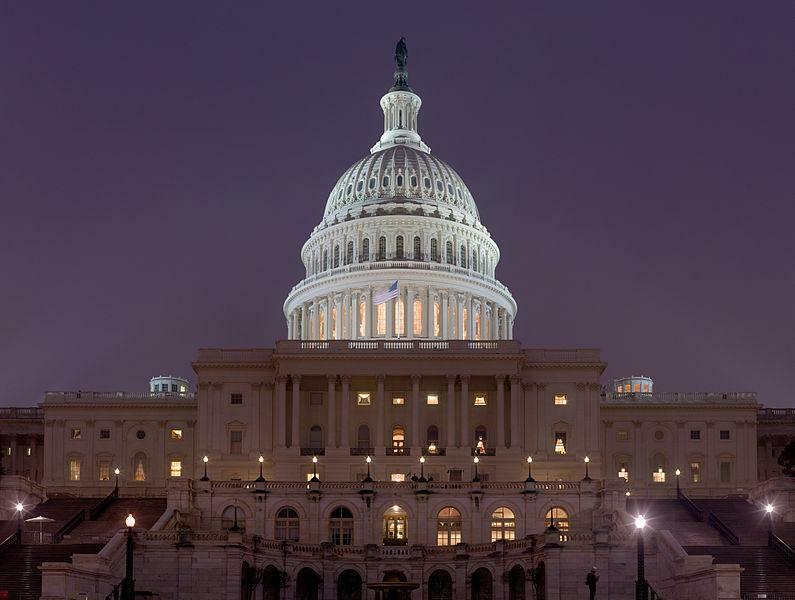 Social Security, Medicare, Medicaid and veterans’ health programs will not be affected by the shutdown. An unknown number of federal employees in Michigan are being furloughed, including about 900 Michigan National Guardsmen and women. And the shutdown may force the cancelation of training for 12,000 guardsmen. Want to get away? Don’t plan on going to one of Michigan’s National Parks. 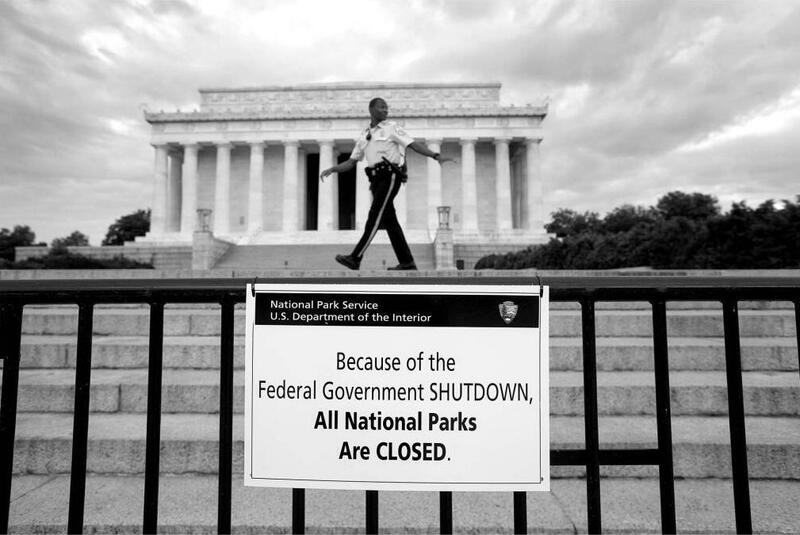 The shutdown will mean the parks will have to close. The effect of the shutdown will expand in Michigan the longer it takes for a deal to be reached in Washington. Update October 1, 7:04 a.m. The federal government is now under a partial shutdown as Congress was unable to pass a bill to fund major portions of the federal government. The Republican-controlled House wanted to delay parts of the Affordable Care Act (the healthcare exchanges open today), and the Senate and the President would not agree to attaching such language to the funding bill. "This perpetual cycle of brinksmanship and crisis has to end once and for all." We'll have more on how this will affect us here in Michigan later today. 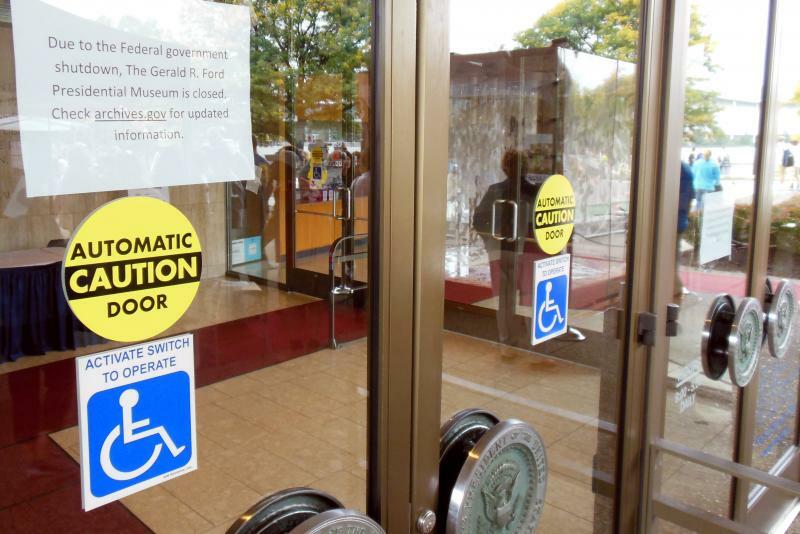 More shutdown fallout... what will happen to the ArtPrize art in the Gerald R. Ford Presidential Library in Grand Rapids? Michigan Radio's Kate Wells explains that the library could go dark at midnight tonight with two top ten finalists locked behind the doors. And on Stateside today, Cyndy Canty spoke with the Detroit News' Washinton D.C. reporter David Shepardson. Canty pointed out that 41% of Michigan's budget comes from the federal government. So the question is, what will happen in Michigan if the federal government is shut down? Shepardson said that if the shutdown lasts one or two days, it won't have a huge effect. But if it's a long, drawn-out shutdown, the state of Michigan won't receive federal dollars in the form of future grants. As an example, he pointed to transportation project money that goes out to enforce seat belt and drunk driving laws over holiday weekends - that money would no longer be available. Shepardson said estimates are that each day the government is shutdown, it costs taxpayers $150 million a day. "It's definitely very pricey, and also think about just the sheer amount of time and effort that's been spent over the last weeks and weeks by these federal agencies figuring out 'how do we shutdown' rather that do the actual jobs that they're supposed to do," said Shepardson. How will the partial government shut down affect Michigan? We are just hours away from what appears likely to be a partial government shutdown. The U.S. Senate, controlled by Democrats, and the Republican-led U.S. House of Representatives, have been unable to come to an agreement on a continuing resolution to fund the federal government. If no agreement is reached today, which appears likely, the government begins shutting down at midnight. David Shepardson, Washington D.C. based reporter for the Detroit News, joined us today from Washington. Special Education students and their families in Michigan are about one month into the new school year and they're feeling the impact of the federal sequester cuts. Today, we looked at the cuts to special ed funding and find out what it means to schools and students. And, a look at social media etiquette and your job--what's allowed and what's not. And, one Detroit musician, and AP reporter, talks about his family's deep roots in Motown. Also, we spoke with one man who has made it his mission to save pinball machines from the scrap yard. He plans to open up a private pinball museum. First on the show, we are just hours away from what appears likely to be a partial government shutdown. The U.S. Senate, controlled by Democrats and the Republican-led U.S. House of Representatives, have been unable to come to an agreement on a continuing resolution to fund the federal government. If no agreement is reached today, which appears likely, the government begins shutting down at midnight.